Synthetic peptide (the amino acid sequence is considered to be commercially sensitive) within Human Pax2. The exact sequence is proprietary. WB: Human fetal kidney tissue lysate IHC-P: Human fetal kidney, human normal kidney, human renal cell carcinoma, mouse liver and rat cerebral cortex tissues. ICC/IF: HEK293 cells. Flow Cyt: HEK293 and K562 cells. Our Abpromise guarantee covers the use of ab215974 in the following tested applications. WB Use at an assay dependent concentration. Detects a band of approximately 45 kDa (predicted molecular weight: 45 kDa).Can be blocked with Pax2 peptide (ab188213). Immunohistochemistry (Formalin/PFA-fixed paraffin-embedded sections) - Anti-Pax2 antibody [EP3251] - BSA and Azide free (ab215974)Image from Lee SB et al. PAX2 regulates ADAM10 expression and mediates anchorage-independent cell growth of melanoma cells. PLoS One 6:e22312 (2011). Immunohistochemical analysis of Pax2 expression in tissue sections of benign nevi and malignant melanoma using ab79389 at 1/100 dilution. All specimens were fixed in 4% formaline (pH 7.4), embedded in paraffin followed by cutting with a microtome (3 µm thickness). The slides were deparaffinized in xylol for 20 minutes and then rehydrated in descending series of ethanol (100%, 100%, 96%, 96%, 70%, and 70%). For antigen retrieval the slides were boiled in citrate buffer (pH 6.0) for 40 min, and then allowed to cool down for 15 min. After washing with PBS buffer the endogenous peroxidase was blocked with H2O2 for 15 min at room temperature. After washing in PBS the slides were incubated with the antibody against PAX2 (dilution 1:100) for 60 min at room temperature and washed in PBS again. The secondary antibody was incubated for 20 min at room temperature and after washing the slides in PBS the biotin streptavidine label was incubated for 20 min at room temperature. A detection kit including horseradish peroxidase and diaminobenzidine as chromogene was applied for 5 min. Counterstaining was performed with hematoxilin for 6 min. (A) In normal sweat glands, Pax2 is expressed in gland epithelial cells (black arrows) while intermingled stromal cells only show very weak or absent nuclear Pax2 expression (green arrow) Bar represents 100 µm. 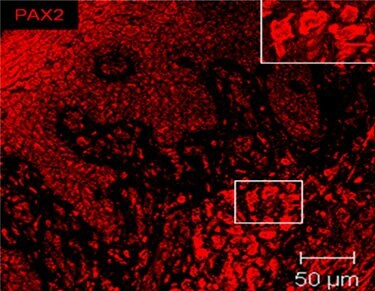 (B, C) Normal appearing epidermal cell layers adjacent to (B, bar represent 100 µm) nevi or (C, bar represent 200 µm) malignant melanoma show a differentially Pax2 expression with strongest Pax2 levels in germinal basal cell layers (black arrows) decreasing in higher differentiated keratinocytes and finally being absent in corneocytes (green arrows). (D) Malignant melanoma cells - heterogeneous nuclear Pax2 expression. Strongest expression in large atypical nuclei with prominent nucleoli (black arrows). (E, F) Pax2 expression in intradermal nevi was heterogeneous and did not correlate with histological features. 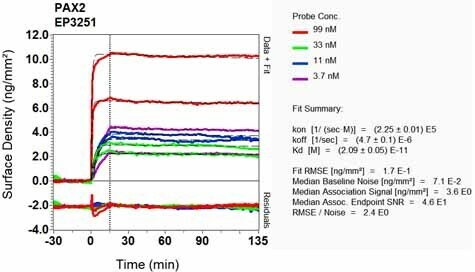 This data was developed using the same antibody clone in a different buffer formulation containing PBS, BSA, glycerol, and sodium azide (ab79389). Immunocytochemistry/ Immunofluorescence - Anti-Pax2 antibody [EP3251] - BSA and Azide free (ab215974)Image from Lee SB et al. PAX2 regulates ADAM10 expression and mediates anchorage-independent cell growth of melanoma cells. PLoS One 6:e22312 (2011). Pax2 is expressed in melanocytes of benign nevi (A) and melanoma cells of patients with malignant melanoma (B). Cells were grown on coverslips and fixed with 4% paraformaldehyde/PBS. After washing the cells with PBS, cells were permeabilized and blocked with 0.1% Triton X-100/PBS containing 5% BSA. Pax2 (green) was examined by immunofluorescent analysis using ab79389 at 1/100 dilution (incubated for 1 hour at room temperature). Following 3 times washing, bound antibodies were deteced by Alexa 488 conjugated goat anti-mouse or Cy3 conjugated goat anti-mouse secondary antibodies. Following PBS-washing nuclei were stained with 4′6-diamidino-2-phenylindole (DAPI, Blue) and cells were mounted in Fluoromount-G™ and examined by fluorescence microscopy. White arrows in the higher magnified insets indicate PAX2 expression in nucleoli of melanocytes of benign nevi (A), yellow arrows in the higher magnified insets specify PAX2 expression in nucleoli of melanoma cells (B). 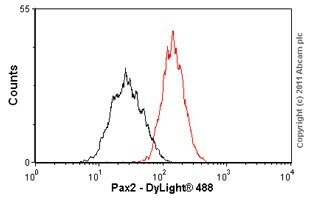 Flow Cytometry analysis of K562 cells labelling Pax2 with purified ab79389 at a dilution of 1/50 (red). Cells were fixed with 4% paraformaldehyde. 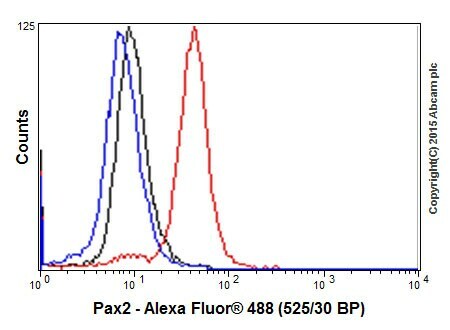 An Alexa Fluor® 488-conjugated goat anti-rabbit IgG (1/500) was used as the secondary antibody. Black - Isotype control, rabbit monoclonal IgG. Blue - Unlabelled control, cells without incubation with primary and secondary antibodies. Immunocytochemistry/Immunofluorescence analysis of HEK293 cells labelling Pax2 with purified ab79389 at a dilution of 1/50. Cells were fixed with 4% paraformaldehyde and permeabilized with 0.1% Triton X-100. ab150077, an Alexa Fluor® 488-conjugated goat anti-rabbit IgG (1/1000) was used as the secondary antibody. DAPI (blue) was used as the nuclear counterstain. ab7291, a mouse anti-tubulin (1/1000) and ab150120, an Alexa Fluor® 594-conjugated goat anti-mouse IgG (1/1000) were also used. Control 1: primary antibody (1/50) and secondary antibody, ab150120, an Alexa Fluor® 594-conjugated goat anti-mouse IgG (1/1000). Immunohistochemistry (Formalin/PFA-fixed paraffin-embedded sections) analysis of rat cerebral cortex tissue labelling Pax2 with purified ab79389 at a dilution of 1/500. Heat mediated antigen retrieval was performed using EDTA buffer pH 9. ab97051, a HRP-conjugated goat anti-rabbit IgG (H+L) was used as the secondary antibody (1/500). Negative control using PBS instead of primary antibody. Counterstained with hematoxylin. Immunohistochemistry (Formalin/PFA-fixed paraffin-embedded sections) analysis of mouse liver tissue labelling Pax2 with purified ab79389 at a dilution of 1/500. Heat mediated antigen retrieval was performed using EDTA buffer pH 9. ab97051, a HRP-conjugated goat anti-rabbit IgG (H+L) was used as the secondary antibody (1/500). Negative control using PBS instead of primary antibody. Counterstained with hematoxylin. Immunohistochemistry (Formalin/PFA-fixed paraffin-embedded sections) analysis of human kidney tissue labelling Pax2 with purified ab79389 at a dilution of 1/500. Heat mediated antigen retrieval was performed using EDTA buffer pH 9. ab97051, a HRP-conjugated goat anti-rabbit IgG (H+L) was used as the secondary antibody (1/500). Negative control using PBS instead of primary antibody. Counterstained with hematoxylin. Immunohistochemistry (Formalin/PFA-fixed paraffin-embedded sections) analysis of (A) human fetal kidney, (B) human normal kidney and (C) human renal cell carcinoma tissues labelled Pax2 with unpurified ab79389 at a dilution of 1/1000. 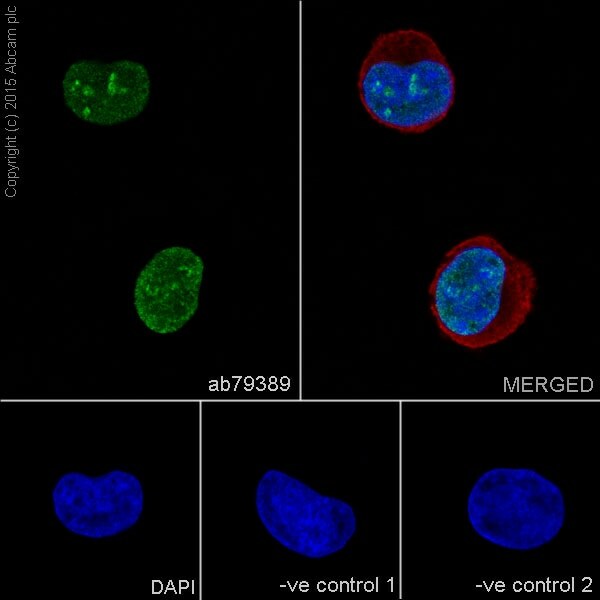 Overlay histogram showing HEK293 cells stained with unpurified ab79389 (red line). The cells were fixed with methanol (5 min) and then permeabilized with 0.1% PBS-Tween for 20 min. The cells were then incubated in 1x PBS / 10% normal goat serum / 0.3M glycine to block non-specific protein-protein interactions followed by the antibody (unpurified ab79389, 1/50 dilution) for 30 min at 22°C. The secondary antibody used was DyLight® 488 goat anti-rabbit IgG (H+L) (ab96899) at 1/500 dilution for 30 min at 22°C. Isotype control antibody (black line) was rabbit monoclonal IgG (1µg/1x106 cells) used under the same conditions. Acquisition of >5,000 events was performed. This antibody gave a significantly decreased signal in HEK293 cells fixed with 4% paraformaldehyde (10 min)/permeabilized in 0.1% PBS-Tween used under the same conditions. Immunohistochemistry (Formalin/PFA-fixed paraffin-embedded sections) - Anti-Pax2 antibody [EP3251] - BSA and Azide free (ab215974)Image from Lee SB et al. PLoS One. 2011;6(8):e22312. Epub 2011 Aug 18. Fig 5.; doi:10.1371/journal.pone.0022312; August 18 2011 PLoS ONE 6(8): e22312. Immunohistochemical analysis of Human malignant melanoma tissue, staining Pax2 with unpurified ab79389. Antigen retrieval was performed via heat mediation in a citrate buffer (pH 6). Sections were blocked with 0.1% Triton X-100/PBS containing 1% BSA and 10% horse serum for 1 hour. Samples were incubated with primary antibody overnight at 4°C. A Cy3®-conjugated goat anti-rabbit IgG was used as the secondary antibody. Publishing research using ab215974? Please let us know so that we can cite the reference in this datasheet. There are currently no Customer reviews or Questions for ab215974.